Personally my dogs are family and they live inside.. yes they are danes and are totally not built for the cold but that is beside the point. Most jurisdictions have laws on providing adequate sheltering, access to food and fresh water regardless of breed. ThePetsTech.com has boiled it down pretty well. Winter time is when it is time to pay closer attention to your dog and the temperature out side. 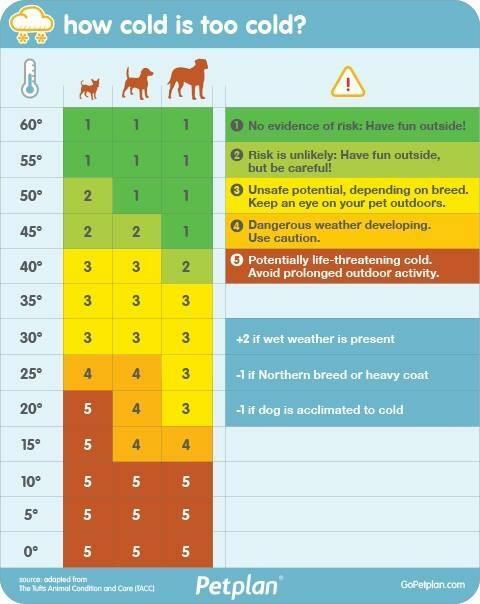 According to the chart provided by Petplan, once it gets to be 35 degrees on a regular basis that there is potential for unsafe conditions. In most of the Northeast this will be around late December through March. When it becomes 25 degrees you need to pay special attention if you have a smaller dog. If you have a larger bread these are moderately safe conditions. Just make sure not to stay outside too long. Once it becomes 15 degrees, most dog owners have to make sure they are paying close attention to their dogs when they are outside. If you are letting your dog out to use the bathroom, make sure he or she comes back in shortly after. If you are out on a walk make sure to pay attention to the dogs behavior and any signs of discomfort. At 10 degrees it becomes extremely dangerous for almost all breeds. If you have a Northern breed or a breed with a heavy coat then you should pay attention, but your dog is usually safe.